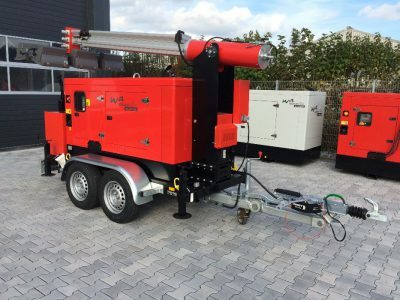 Our WA-basic model of mobile floodlight power generators unit provides an optimal solution of the basic requirements for the fire brigade, police and for utilities in power conversion and floodlights. 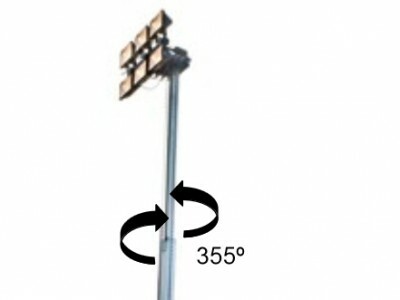 Our Floodlight Power Generator series 9300 with 6 Halogen spotlights, each 1.500 watt, and a maximum height of 9,30 meters. Power generator: The complete genset is mounted on a base frame made of welded square profiles of Steel in a robust design. On base frame specially designed devices for lifting are mounted with crane. 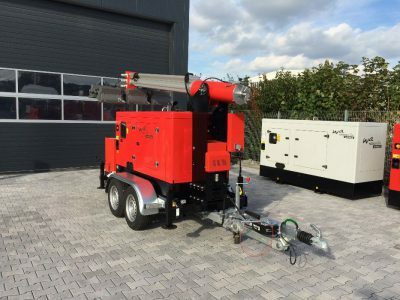 The diesel engine and the generator are directly connected via a SAE-fange so that even after prolonged operation there is no possibility of misalignment. The day tank is integrated into the base frame. The starter battery (12 Volt DC) is mounted on the base frame and wired for instant operation. 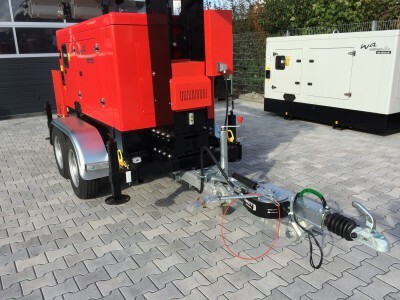 The sound isulation of the power generator is modular on base frame, powder coated in RAL 7035 light gray (any RAL color is available as an option) with generous doors for maintenace. All doors are lockable. The supply an exhaust air is incorporated into the structure. The exhaust muffler is mounted in the exhaust air. Engine: Original Deutz industrial diesel engine 4-stroke direct injection, liquid cooled 1.500 r.p.m. (50 Hz). Low oil fuel consumption with long maintenance intervals make Deutz engines to a very economic engine application for your emergency supply. Alternator: Mecc Alte synchronous alternator, brushless self-regulating with electronic voltage regulator (AVR) to VDE 0530, 400/230 volt, 4-poles, insulation class H.
Switchgear: Manually Start System with engine monitoring (Deep SEA DSE 3110) and shutdown Low oil pressure, high temperature, overspeed, generator switch (4-pole) with thermal and magnetic tripping. Features: frequency meter, hour meter (digital to the control), 1 x Voltmeter with 7 digit switcher and 3 ammeters, 1 Analog fuel gauge, optical and acoustic alarm indication in case of malfunction. Outgoing panel with outlets (WA-D- 20 LM 1 x CEE 32 Ampere), 1 x CEE 63 amp, 1 x CEE 16 Ampere and an AC outlet. Other socket configurations according to customer requirements are possible. Trailer to WA-D 40 LM: With a gross vehicle weight of 2.500 KG consisting of two rubber torsion axles per 1.350 KG and tires 185 R 14 C with steel frame, galvanized steel. Two steel sheet mudguards, closed inside. Infinitely height adjustable drawbar (Knott KHD 25), 400 to 1.100 mm Height attachments with DIN truck eye and ball couppling for car. Hazard lights in 12 Volt (optional 24 Volt) with 13-pin connector. A 100 km/h approval is available at extra cost. Trailer WA-D 100 LM: With a gross vehicle weight of 3.500 KG consisting of two rubber torsion axles per 1.750 KG and tires 185 R 14 C with stell frame, galvanized steel. Two steel sheet mudguards, closed inside. Infinitely height adjustable drawbar (Knott KHD 27), 400 to 1.100 mm trailer height with DIN truck eye and ball coupling for car. Hazard lights in 12 Volt (optional 24 Volt) with 13-pin connector. 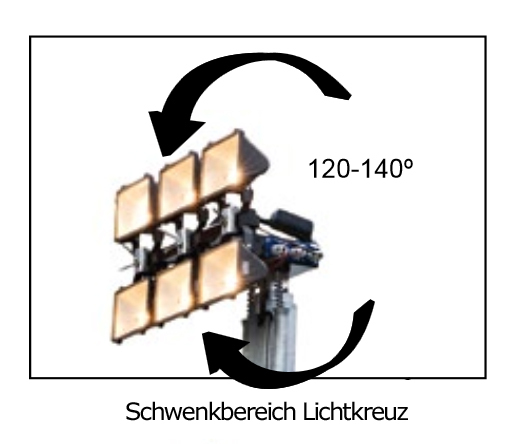 Floodlight power generator: With a telescopic mast, galvanized, electro-hydraulically controlled mast, overall height 9,30 meters, horizontal rotation (on the vertical axis) 355° manually adjustable, vertrical rotation of the lamp cross (on the horizontal axis) 120-140° with electric adjustment, a large storage box at the rear of vehicle mounted load 100 KG. 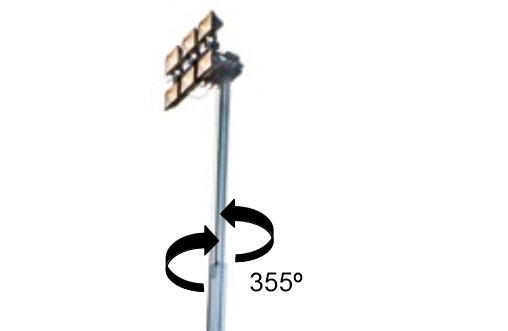 Spotlight: The series supplied the light pole unit is supplied with 6 halogen spotlights each 1.500 watt (198.000 lumen) to IP 55th. 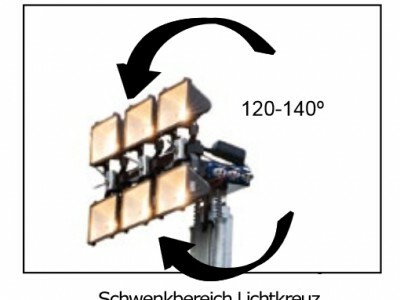 The bulbs can be configured and delivered according to customer requirements. The performance and data relating to ISO 8528: +25°C, 100 NN, relative humidity 30% power reduction in accordance with DIN ISO 3046, standard values: above 100 m approx 1% per 100 m, above 25°C (77°F) above 4% per 10°C (50°F). *PRP: The variable aggregate continous power is the maximum power that is available between the required maintenance intervals in the specified environmental conditions during varied power with unlimited number of operating hours per year. The maintenance is carried out according to the manufacturers instructions. 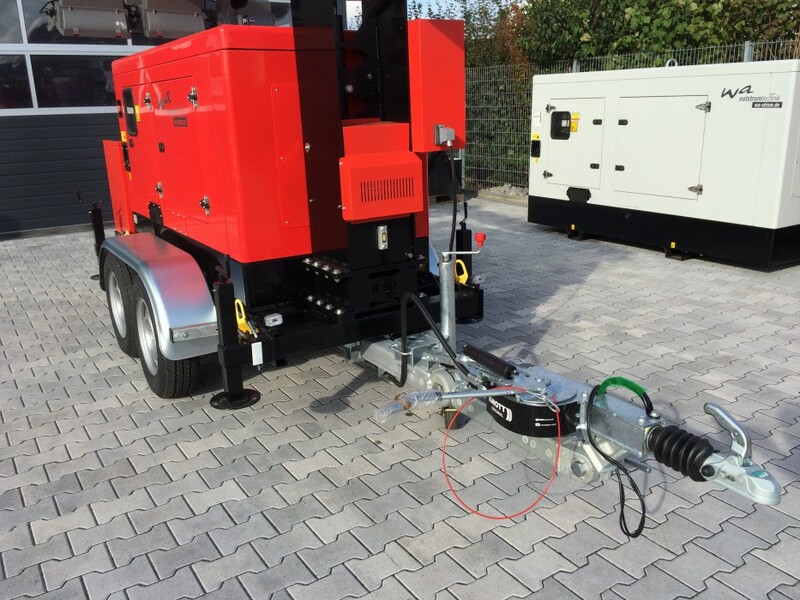 The permissible average power output for 24 hours must not exceed a certain percentage of the variable aggregate continous power, which is dtermined by the manufacturer of the diesel engine. 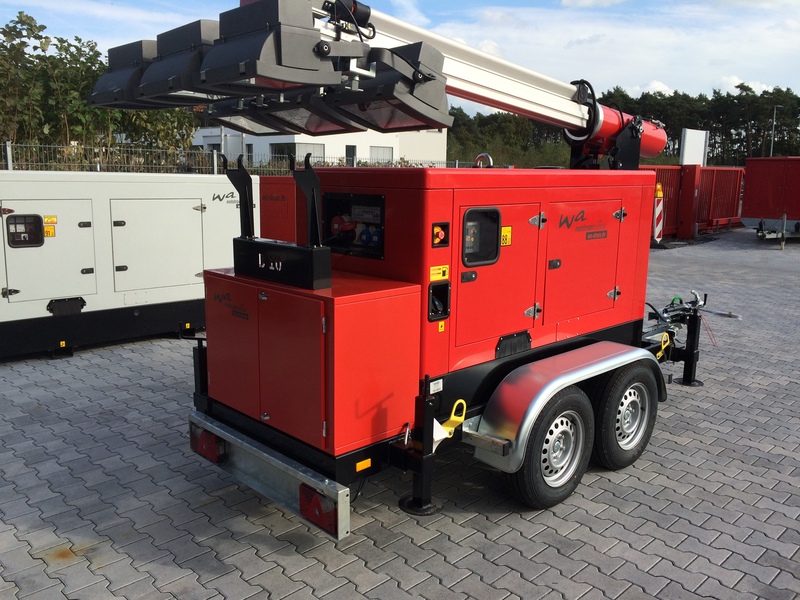 LTP: Is the maximum available power during operation of 500 hours per year. For this performance, no overload is available. I agree that my details and data will be collected and stored electronically to answer my request. 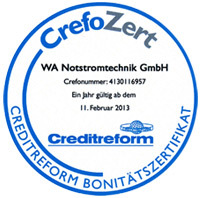 Note: You can revoke your consent at any time for the future by sending an email to info@wa-strom.de.